BRCA1 as tumor suppressor: lord without its RING? BRCA1 is a tumor suppressor with critical roles in the maintenance of genomic stability. It encodes a large protein with an amino-terminal RING domain that possesses ubiquitin-ligase activity. Given the occurrence of numerous cancer-causing mutations within its RING domain, investigators have long suspected that BRCA1's ubiquitin ligase is important for its tumor suppression and DNA repair activities. Using genetically engineered mouse models, two recent studies shed light on this age-old hypothesis. Germline mutations in the BRCA1 and BRCA2 genes account for 5% of all breast cancers and nearly 80% of families with hereditary breast cancer and ovarian cancer. These genes preserve genomic integrity by playing important roles in multiple DNA damage response path-ways, including homologous recombination repair . BRCA1 encodes a large 1,863-amino-acid protein that harbors an amino-terminal RING domain and two tandem carboxy-terminal BRCT domains (Figure 1a). The RING domain functions as an E3 ubiquitin ligase by recruiting an E2 ubiquitin-conjugating enzyme, while the BRCT domains are phosphopeptide recognition modules [2, 3] that enable BRCA1 binding to phosphorylated partners such as Abraxas, BACH1, and CtIP . Cancer-causing mutations in patients occur in both the RING and BRCT domains. BRCA1 domain organization and structure. (a) Domain organization of BRCA1 showing the amino-terminal RING and carboxy-terminal BRCT repeats. (b) Nuclear magnetic resonance structure of the heterodimer formed between the BRCA1 and BARD1 RING domains. The E2 enzyme interacts with the BRCA1 RING domain but not with the BARD1 RING domain . Mutated residues are indicated. BRCA1 is unlike most E3 ubiquitin ligases in that its activity is enhanced by dimerization with the RING domain of a second protein, BARD1. The RING domains of BRCA1 and BARD1 form a four-helix bundle. Of note, the E2 enzyme makes contacts with the RING domain of BRCA1 but not with that of BARD1 (Figure 1b) . 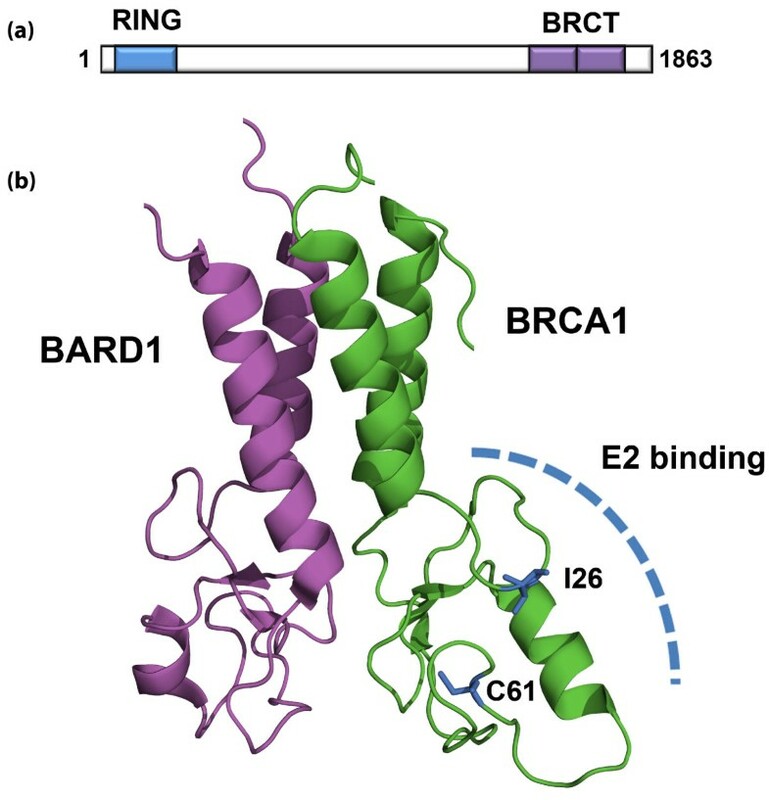 The mechanism by which BARD1 promotes BRCA1 ligase activity is therefore unclear but may involve stabilizing a conformation of BRCA1 optimal for E2 binding. Using elegant mouse models, two recent studies have examined the effect of missense RING mutations on the tumor suppression and DNA repair activities of BRCA1 [5, 6]. Shakya and colleagues generated mice expressing BRCA1 with the mutation I26A . This mutation abrogates E2 binding (and thus ubiquitin-ligase activity) but allows assembly of the BRCA1/BARD1 heterodimer. Notably, the BRCA1 RING can directly bind at least eight E2 enzymes, all of which support mono-ubiquitination or poly-ubiquitination in vitro, and I26A mutation ablates interaction with each of these E2 enzymes . Surprisingly, the authors found that the I26A mutation in mice prevented tumor formation to the same degree as wild-type BRCA1 in three conditional genetic models. Furthermore, the DNA damage response remained intact with no changes in chromosome stability or sensitivity to genotoxic stress in mouse embryonic fibroblasts. In prior work, the authors had shown this mutation also conferred no changes in homologous recombination or Rad51 foci formation after ionizing radiation in embryonic stem cells . After demonstrating dispensability of E3 ligase activity for tumor suppression, Shakya and colleagues shifted their attention to the BRCT domains. They engineered mice with the mutation S1598F, which is known to disrupt BRCT phosphopeptide binding at the analogous site (S1655) in human BRCA1  and to cause cancer in patients. In contrast to I26, mutation of S1598 resulted in impaired homologous recombination, reduced Rad51 foci formation after ionizing radiation, increased chromo-some instability, and hypersensitivity to genotoxic stress in mouse embryonic fibroblasts. Consistent with the elevated genomic instability, the mice developed tumors at an accelerated rate in the same three genetic backgrounds. In a second study, Drost and colleagues also evaluated the BRCA1 RING domain by generating mice with the distinct mutation C61G, which occurs in breast cancer patients . This mutation disrupts zinc ion binding necessary for stability of the RING structure. Consequently, it abolishes interaction not only with E2 conjugating enzymes but also with BARD1 . In the absence of p53, mice bearing the C61G mutation developed breast tumors at the same rate as BRCA1 null mice. Differences with null mice emerged, however, when examining responses to genotoxic stress, as C61G tumors were less sensitive to both cisplatin and the poly(ADP-ribose) polymerase inhibitor olaparib. C61G tumors also acquired resistance to cisplatin, whereas BRCA1 null tumors remained responsive over a 250-day period. Because cells from C61G tumors developed more ionizing-radiation-induced Rad51 foci than cells from BRCA1 null tumors, Drost and colleagues proposed that hypomorphic DNA repair activity may account for the acquired resistance. Perhaps hypomorphic repair allows tumors to sustain continued damage until upregulation of a suppressor pathway occurs. To what extent the C61G mutant truly retains hypomorphic activity must be clarified, however, as homologous recombination in this mutant was identical to that in BRCA1 null cells . These two enlightening papers provide new insight into function of the BRCA1 RING domain. Contrary to prior hypotheses, the first study suggests the ubiquitin ligase activity of the RING domain is not essential for BRCA1's roles in genomic maintenance and tumor suppression . Conversely, structural integrity of the RING domain is necessary , and this may be related to mediation of tumor suppressor activity by BARD1, independent of BARD1's influence on BRCA1 ligase function. This model is consistent with the finding that BARD1 null mice develop breast cancer . Interestingly, Shakya and colleagues showed that ionizing-radiation-induced formation of conjugated ubiquitin foci (detected by the antibody FK2) was not affected by I26A mutation . However, prior studies have demonstrated that these foci are abrogated by BRCA1 depletion using RNAi [10–12]. Is it possible that BRCA1-dependent ubiquitination at DNA damage foci may be due to a downstream un-identified E3 ligase? Perhaps, but we also cannot rule out the possibility that I26A mutation allows limited in vivo interaction with one of 38 E2 enzymes  not previously detected in prior, albeit very rigorous, studies of BRCA1 binding [7, 14] and that such interaction is sufficient for ubiquitination of some BRCA1 substrates. Examining whether I26A mutation affects DNA damage-induced ubiquitination of CtIP or other BRCA1 proposed substrates  would be informative. A third study recently suggested that BRCA1 ubiquitinates histone H2A to repress satellite DNA . This study demonstrated that I26A mutation leads to transcriptional derepression of satellite DNA and that addition of exogenous satellite RNA to cells inhibits homologous recombination. Reconciling these results with the normal homologous recombination observed in I26A mutants by Reid and colleagues  is difficult. Despite such discrepancies, these new studies reveal intriguing results about BRCA1 biology and set the stage for future work on this complex protein. AEHE is supported by fellowships from The Jane Coffin Childs Foundation and The American Society for Radiation Oncology. SJE is an investigator with the Howard Hughes Medical Institute.